2. 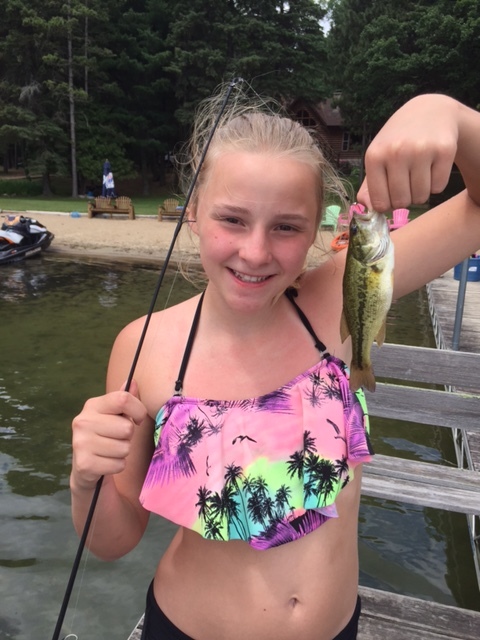 She was with her family and her dog, Cooper, was close by when whe caught this little black bass. 3. The bait Ellie used was Powerbait. 4. She was at her family's cabin on the northwest end of the lake. 5. The fish was caught over the 4th of July weekend 2016, around 11:00 in the morning. 6. Ellie loves to fish from the end of the dock. It's just one of her many favorite pastimes at the cabin! She catches all sorts of pan fish, along with both rock and large mouth bass! Also Wishing Everyone a Happy New Year...especially to all of those who are ice fishing this winter. Stay safe and have fun. Send your winter pictures in too.